Classroom based learning is an important part of an undergraduate education. However, experiencing the full flavor of scientific work requires the addition of a different type of opportunity. Independent study research experiences are designed to complement regular courses by offering in-depth projects concentrating on one topic. Typically students work a full semester or a full summer on one particular project. Working closely with a faculty member, the student defines a research project, carries out experiments, and analyzes the results. The project culminates in a written report and oral presentation. Most students also present their projects at external scientific meetings, such as regional meetings of the American Chemical Society and similar groups. The department also offers smaller scale opportunities to explore research, through the Chem 205 course. Summer is an ideal time for immersing oneself in an independent study project. Many Roanoke graduates report their summer research experiences to be among the most memorable experiences of their undergraduate careers. To support the Chemistry Department's summer research program, a number of donors (including many past participants) have given money to the Bondurant Fund, which is used solely for the purpose of providing stipends to summer research students in the Chemistry Department. This support allows several students each summer to concentrate full time effort on their independent study projects. 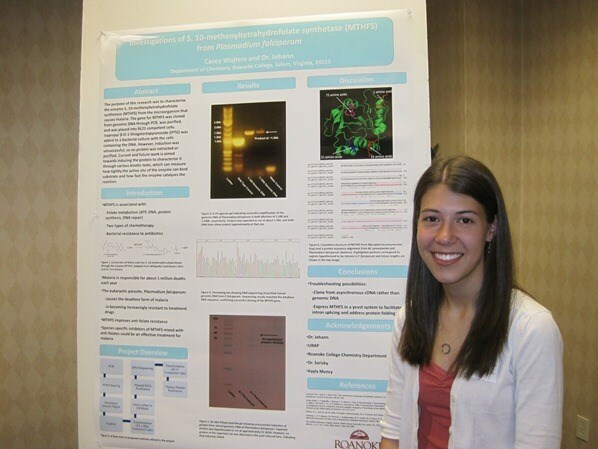 Roanoke College offers a college-wide program that supports student researchers in the summer. A stipend and housing are provided for over a dozen students each summer, with projects drawn from all academic disciplines on campus. In addition to their disciplinary research, participants have regular meetings to share current research reports and to explore other common interests, such as learning the oral and written presentation skills they will use at the conclusion of their projects. Additional funding exists for students pursuing independent study projects. Certain research projects have external funding specific to that project. Those external grants cover both research expenses and student stipends. For general information on undergraduate research opportunities, contact Dr. Cathy Sarisky at sarisky@roanoke.edu, or see her in room 565A of Trexler Hall. Computational chemistry and molecular simulation, contact Dr. Kelly Anderson at kanderson@roanoke.edu. Organic synthesis and organometallic chemistry, contact Dr. Skip Brenzovich at brenzovich@roanoke.edu. Organic synthesis and photochemistry, contact Dr. Gary Hollis at hollis@roanoke.edu. 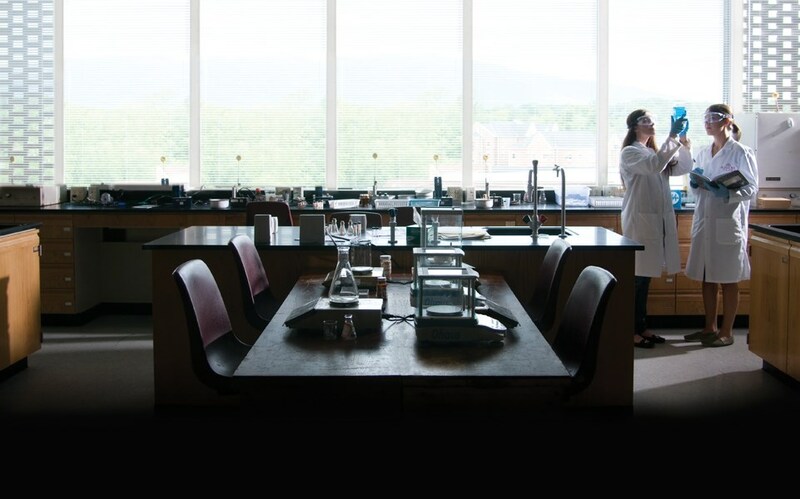 Biochemistry of enzymes, including structure/function investigations of active sites, contact Dr. Tim Johann at johann@roanoke.edu. Biochemistry research projects (protein structure and function, purine biosynthesis), contact Dr. Cathy Sarisky at sarisky@roanoke.edu.